Aquatechnique started in the PADI Scuba Diving business as a small centre, we have been involved in Diver training for over 30 years, and we never forget our roots. Our customers have helped us grow over the years, to become Leicester�s premier PADI diving centre. We remember the people who got us here, and don�t forget that many more future customers will help us grow even further. The majority of our diving team are University graduates, some have given up their professions in order to teach this great sport, remuneration is not the driving force in the diving industry, it is the passion and affection for the sport, and the camaraderie of the people involved in it. We offer �one to one� scuba diving tuition, learn to dive with a time table to suit your commitments or choose a dive course from our courses calendar. We have our own private heated dive pool here in Leicester (a toasty 32�C) and our classrooms are fully equipped with Powerpoint, DVD / Video, OHP and a range of teaching aids / diving materials. 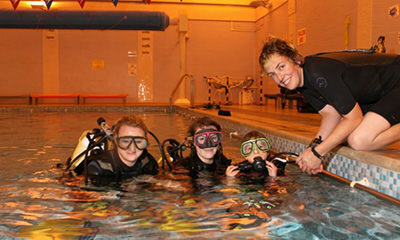 Learn to dive in a relaxed and comfortable environment. Our Dive vans are fully kitted out with diving and safety equipment, they also have Whiteboards, DVD and Video screen which allows us to refresh the classroom based theory at the dive site. We also have a fully stocked Dive shop, we have over 3000 sqft of floor space packed with everything you would need, and more besides. Our pool is open to PADI & BSAC divers alike. We like inviting people to come along and try out their new kit, or simply help them make an informed choice when purchasing equipment from our shop. Why not just visit us and see how we operate, meet the diving team, and over a cup of coffee, you can feel free to ask any dive question or have a preview of our scuba diving courses.